Townsville could very well be the most exciting housing market in Australia at the moment. Townsville is a major regional hub in North Queensland, an easy 2 hour flight from Brisbane with a population base of approximately 180,000 people. The median house price in Townsville has taken a bashing over the last 10 years and is currently -12% lower than in 2008. Units are even worse off, with prices 22% lower in 2018 than they were in 2008. So, why is this extremely poor performance over the last decade exciting? Let’s look at some data that our research department at Performance Data has analysed. Performance Data’s calculations have the Affordability Index (AI) for houses at 17%. That is, 17% of the average wage goes towards paying the average sized mortgage. This means houses are as affordable as they were in 2001, which is the last time that the AI was this low. Units are even more affordable with the AI at 13%. So what happened to prices after 2001? Well, between 2002 and 2007 house prices increased 148%. 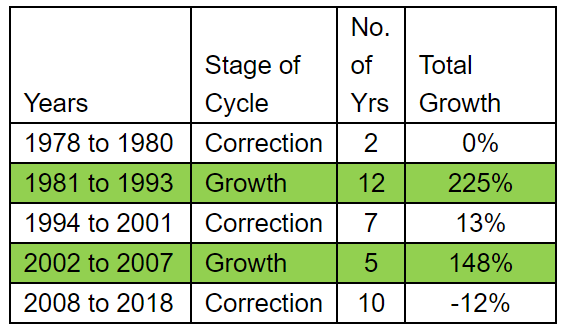 As can be seen below, the Townsville housing market has a clear pattern of a correction period followed by a growth period and when the fundamentals align this market should once again see growth. Let’s take a look at these fundamentals. The 2017-18 financial year saw dwelling approvals the lowest they’ve been since 2007 and vacancy rates have now dropped from a high of 6.3% in 2016 to 3.8% and we've started to see an increase in rents for both houses and units. A positive sign for the housing market but we also need vacancy rates to fall further. Population growth has remained positive but the 0.83% growth in 2016 to 2017 is well below the highs of 2-3% growth that was experienced a decade ago. More people, more demand for houses. What does this market need for a turn around? Jobs and confidence! In 2002 the unemployment rate averaged 7.5% for the year, there was an increase to 8.7% in 2003 but from there the unemployment rate declined to a low of 3.3% in 2008. Performance Data calculates that there is approximately $2400 per person being spent on Infrastructure projects this year. We need to see some more big project announcements as the Stadium which is expected to be completed by 2020 so far just hasn’t cut it. Big project announcements equals more jobs and more confidence and then we should see house prices start to rise.